The vice-president of Iraq, Tareq al-Hashemi, has called for talks to be opened with the country's insurgents in an attempt to bring peace. "I do believe that there is no way but to talk to everybody" with the exception of al-Qaeda, he said. He told the BBC that militants were "just part of the Iraqi communities". But he told the BBC that the only way for Iraq to make progress is for negotiations to take place. Apart from al-Qaeda, which he said was "not very much willing in fact to talk to anybody", all parties "should be invited, should be called to sit down around the table to discuss their fears, their reservations". Sunni politicians have said Iraq's national security forces are deeply infiltrated by, and provide a cover for, the Shia militias. On Tuesday General Abdul Hussein al-Saffe, head of policing in Dhi Qhar province, told the BBC he could not trust a third of his officers because they were loyal to militias. The vice-president said the armed forces needed to be purged of such influence. 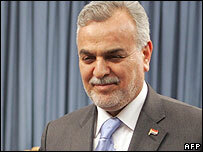 Mr Hashemi expressed unease that the sectarian nature of the conflict was reflected in the present government in Iraq. "[It] might be that the Iraqis need to be convinced that to break up this polarisation we have to go for, first of all, election system reform and second, to go for early elections," he said. Regarding the presence of the US-led coalition, he said many people were "annoyed" because foreign troops were "damaging the dignity of the Iraqis". However he added that the forces should stay in Iraq "until further notice". "We're expecting a timetable, conditional withdrawal," he added. "This could serve the national interests of Iraqis, as well as the national interests of Britain, as well as USA." 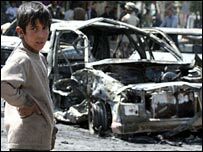 Insurgent and sectarian attacks have claimed tens of thousands of lives since 2003. In the latest violence, a series of car bombs and a mortar attack have killed at least 16 people in Baghdad, on the fourth anniversary of the US-led invasion.